"I just want to thank whoever is helping us save our son. It pains us to see him like this. You saw him and felt his struggle. These days when our own blood doesn't care for us, we are glad to know you are out to help when you see suffering. Thank you." If you meet Baby Sanjiv Kumar, he will steal your heart with his enthusiasm. At 10 months, there's nothing that will stop him from making people smile. Unfortunately, this baby boy has a congenital heart defect that may just claim his life unless he gets a corrective surgery at the earliest. 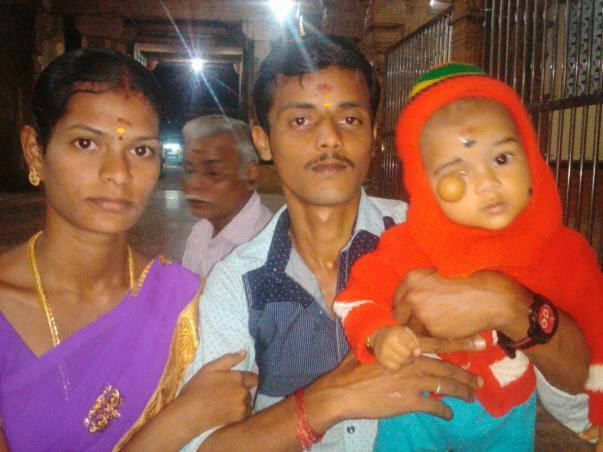 Siva Kumar and Nisha live in Madurai with their 10-month-old son Sanjiv and Siva's parents. Here, Siva Kumar is a laborer at a plasticware manufacturing unit earning Rs. 5500/month. Nisha also works as a maid, and while she can, takes up daily wage jobs to contribute to the household. When Sanjiv was born, the couple were extremely worried about the tumor that was blocking their son's vision and consulted a doctor. At the time, they discovered that he had a congenital heart defect. 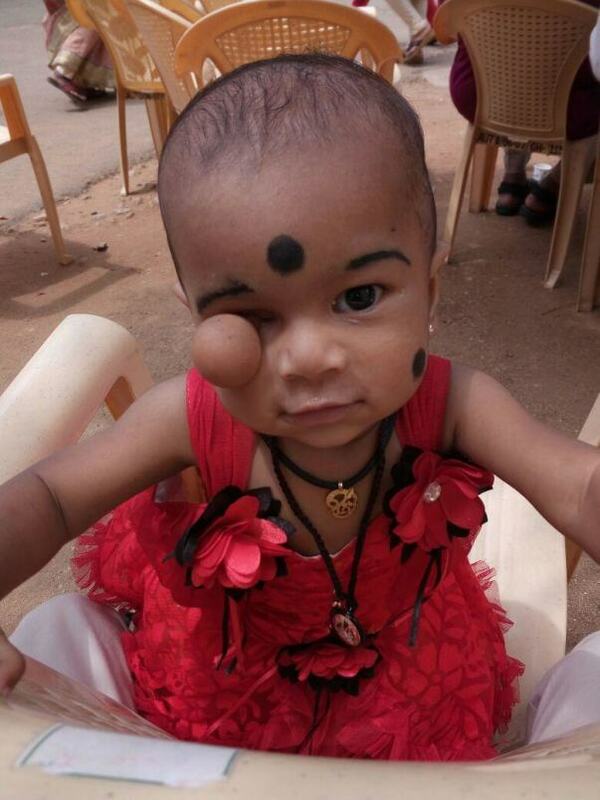 Sanjiv had two holes in his heart. Usually, the condition corrects itself as the child grows up. Unfortunately for Sanjiv, one of the holes got bigger while the other closed up. "It is more than 1cm wide. We took him to several hospitals. Every doctor said we have to go for a surgery at the earliest. But we could not afford the cost. So we kept pushing. It has come to a position where delaying will only add to complications, and we cannot risk that anymore. We cannot lose our son now." 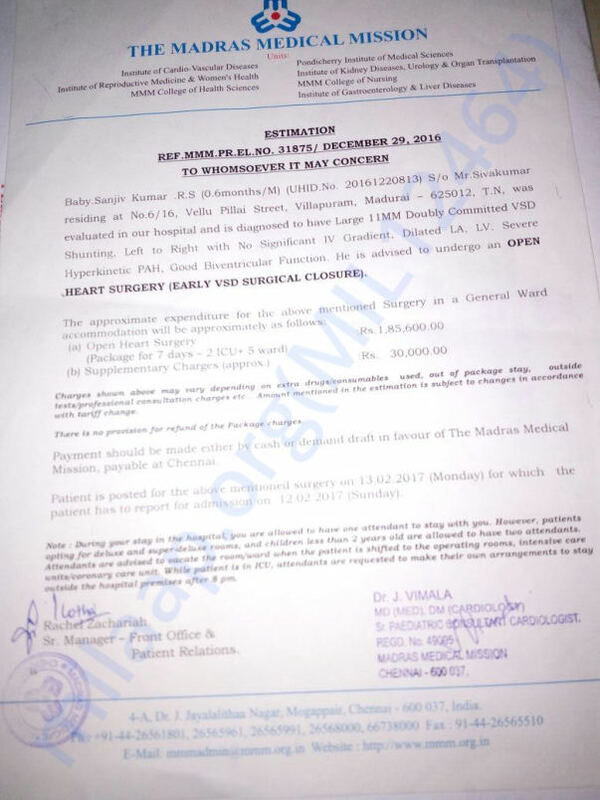 The family has now consulted Madras Medical Mission where a surgeon will perform an open heart surgical closure of the defect. The estimated cost for the surgery including hospital expenses and supplementary charges is Rs. 215,600. "At the end of every month, I have less than Rs. 10 or 20. People like us do not have savings. Our relatives and friends are also in our position. If we borrow, they can only lend Rs. 100 or 200. There's nobody here who can lend us in thousands. So we have to borrow from loan sharks, and we are paying a high interest at almost Rs. 100/day. It is all we can do to keep our son with us." 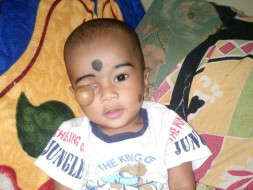 First, Sanjiv needs a heart surgery, and then when he fully recovers, he can get his eyesight too. For parents who are from a weak socioeconomic background, it has been hard to relieve their son's struggles, especially when he presents seizures and breathing difficulties. They pray that someday God will gift their son a life he most deserves. These parents are doing what they can for their baby boy. Your contribution will help them save his life. 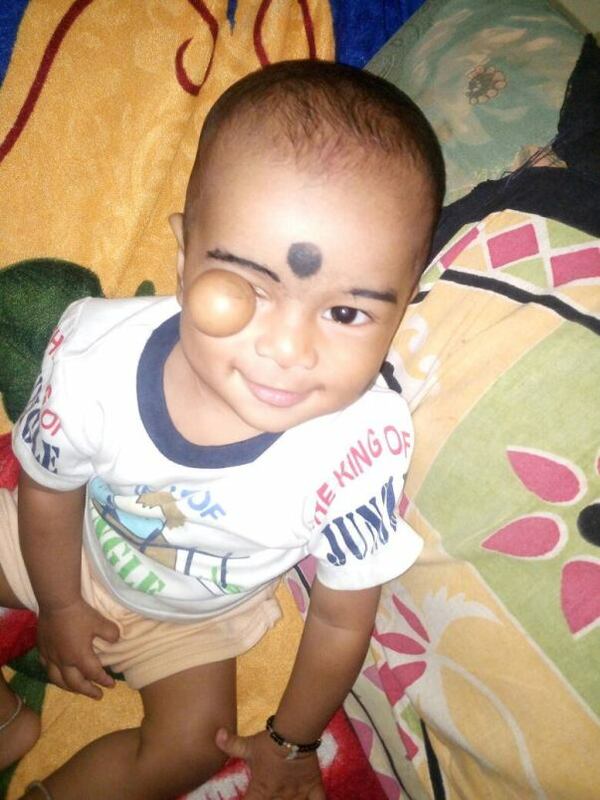 Baby Sanjiv Kumar underwent the operation successfully yesterday. He was admitted to the hospital at 2:30 pm. Surgery ended at 10:30 pm last night and the baby has been moved to ICU. Mother Nisha has been taking care of the baby. "We were struggling for so many months to arrange the funds for my son's surgery. 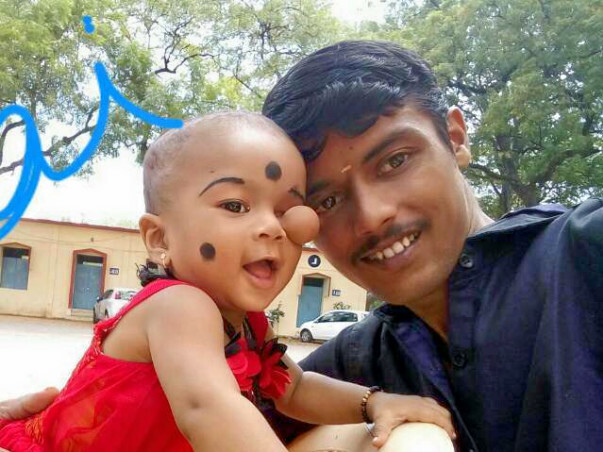 I am thankful to every supporter for giving a new life to my son", says Siva Kumar, father. Our prayers are with you. God bless.